Make cleaning your wheels much easier with the Heavy Duty Wheel Brush. 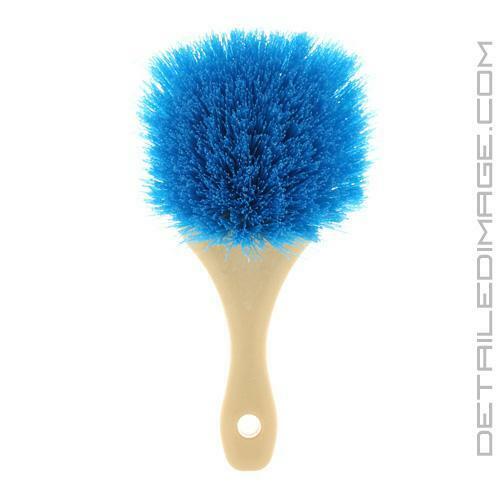 This brush utilizes stiff blue polypropylene bristles that provide extra scrubbing action to help you clean even the toughest contamination off the face of your wheels efficiently. The brush works carefully in between spokes, rivets, other tight areas, and it's also great on the face and lip of the wheel as well. For best results let your brush soak in water, spray your wheels with your favorite wheel cleaner and let it work for about one minute. Then with light pressure scrub the wheels clean! You'll be amazed at how the robust bristles clean the wheels in so little time and with so little effort. When you are all done dunk it in a rinse bucket or hose it out so it's always clean and safe for future uses. Stop staring at dirty wheels, instead use the the Heavy Duty Wheel Brush to remove brake dust and contamination quickly and easily! Very versatile brush... I am using it mainly for lower sections of the vehicle such as lower plastic covers, low gloss wheels, wheel wells. I feel it's a bit to harsh for clear coated wheels that you want to avoid scratches. Could also be good for engine bay use. Great brush but I wouldn't dare use it on wheels. It is really aggressive. It's nice on tires but I really like it in wheel wells because it seems to have shorter bristles than my other flag tips. The brush should really be called a Tire Brush. In fact, it is the best tire brush that I have! 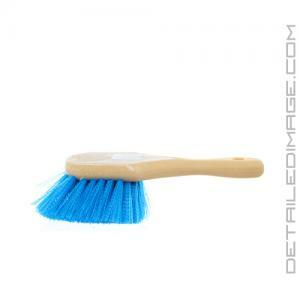 Bristles are stiff and made of plastic so they will not soak up any greasy black stuff like a straw bristle brush. The handle is long enough that I don't hit my knuckles on the ground, but short enough that I can get good leverage on it for scrubbing. A+ brush! I am going to order another one.